DEADLINE ALERT! 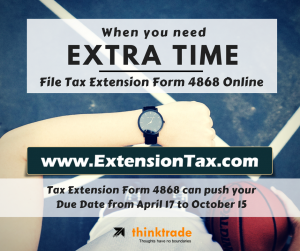 Today is the LAST DAY to file for an Extension! To the Jimmy Quoted rest of us also known as Non-Psychopaths, Today April 17th 2018 is the Official Due date to File and pay your Personal Income taxes. Not everyone is prepared to file their Personal Income Taxes, due to lack of paper work or lack of time. 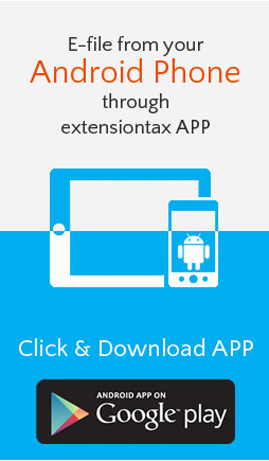 This entry was posted in Efile 7004, Efile an Extension tax, Efile Extension, efile extension form, efile form 8868, efile income tax extension, efiling, efiling Corporate Tax Extension, efiling Easy Extension, efiling Efile 4868, exempt Organisation, Extension form, Extension Tax, Extensiontax, Fast and easy return, file extension online, Form 4868, Form 4868 efile, Form 7004, Form 8868, Form 990, Form 990-T, Get instant Extension, Instant Approval, IRS, IRS Extension, IRS Updates, IRS Videos, NEW PTIN, Online Extension, PTIN, Tax Extension, Tax Return Preparers and tagged Authorized Efile Service Provider, Business Income Tax, Easy Extension, Efile 2350, Efile 4868, Efile 7004, Efile 8868, Efile Extension, Efile for an Extension, express extension, Extend your Deadline, Extension of Time, Federal Income Tax Extension, File Later, File Taxes later, Form 2350, Form 4868, Form 7004, Form 8868, Income tax Extension, IRS Extension, Online Extension, Pay Later, Personal Income tax, Six months Extension, Tax Return Preparers on April 17, 2018 by TaxExpert. 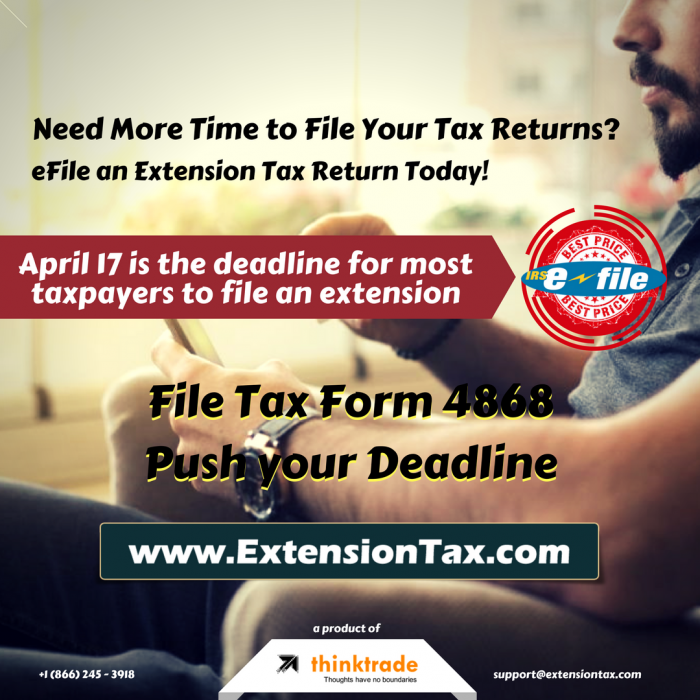 Less Than 48 hours remaining, E-file for an Extension Today! “It’s tax time. I know this because I’m staring at documents that make no sense to me, no matter how many beers I drink.” – Dave Barry. The day Dave was quoting is almost there. YES! 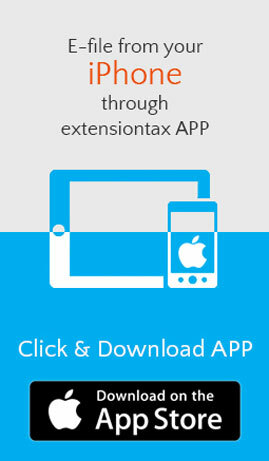 You read that right, Less than 48 hours remaining to file and pay your Personal Income taxes. Not everyone is prepared to file their Personal Income Taxes, due to lack of paper work or lack of time. This entry was posted in Efile 7004, Efile an Extension tax, Efile Extension, efile extension form, efile form 8868, efile income tax extension, efiling, efiling Corporate Tax Extension, efiling Easy Extension, efiling Efile 4868, exempt Organisation, Extension form, Extension Tax, Extensiontax, Fast and easy return, file extension online, Form 4868, Form 4868 efile, Form 7004, Form 8868, Form 990, Form 990-T, Get instant Extension, Instant Approval, IRS, IRS Extension, IRS Updates, NEW PTIN, Online Extension, PTIN, Tax Extension, Tax Return Preparers and tagged Authorized Efile Service Provider, Business Income Tax, Easy Extension, Efile 2350, Efile 4868, Efile 7004, Efile 8868, Efile Extension, Efile for an Extension, express extension, Extend your Deadline, Extension of Time, Federal Income Tax Extension, File Later, File Taxes later, Form 2350, Form 4868, Form 7004, Form 8868, Income tax Extension, IRS Extension, Online Extension, Pay Later, Personal Income tax, Six months Extension, Tax Return Preparers on April 16, 2018 by TaxExpert. 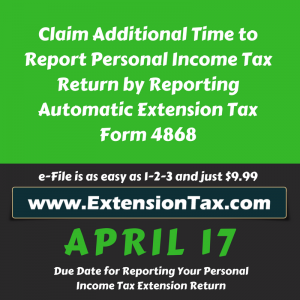 Only a Week Left to E-file your Extension Form 4868! 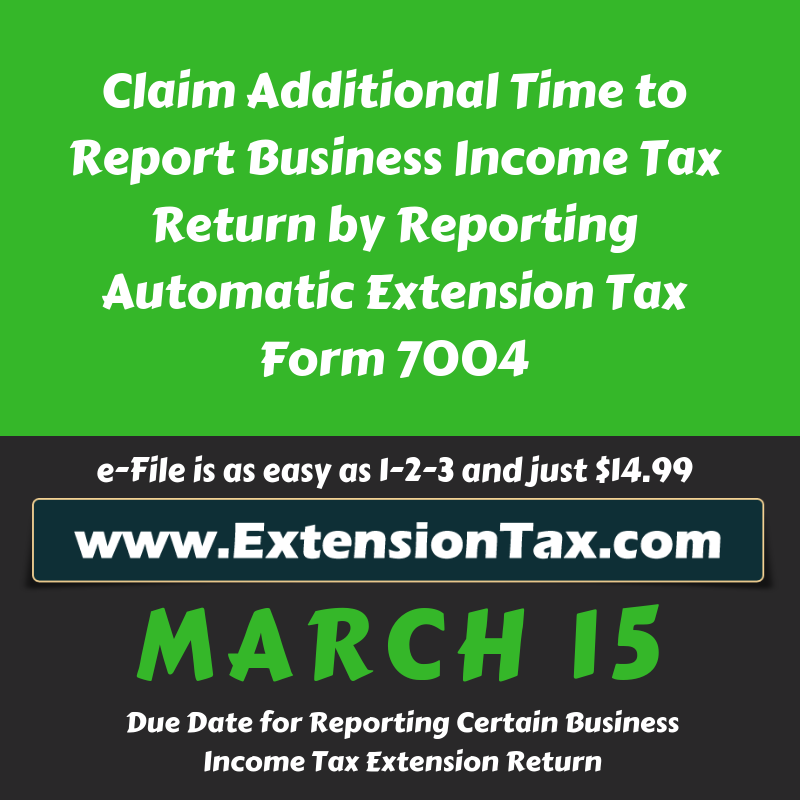 2018 is not only 100 days old but your Personal Income taxes are due in a week’s time. 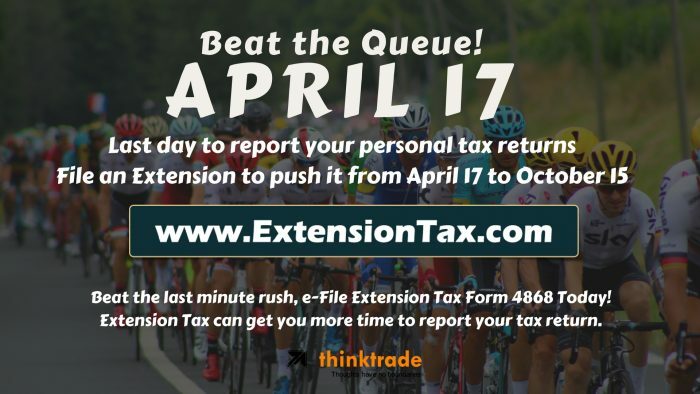 Exactly in a week’s time that is the 17th April 2018, you have to file & pay your Personal Income Tax. If not you are not really going to enjoy the rest of the year. This entry was posted in Efile 7004, Efile an Extension tax, Efile Extension, efile extension form, efile form 8868, efile income tax extension, efiling Corporate Tax Extension, efiling Easy Extension, efiling Efile 4868, exempt Organisation, Extension form, Extension Tax, Extensiontax, Fast and easy return, file extension online, Form 4868, Form 4868 efile, Form 7004, Form 8868, Get instant Extension, Instant Approval, IRS, IRS Extension, Online Extension, Tax Extension, Tax Return Preparers and tagged Authorized Efile Service Provider, Business Income Tax, Easy Extension, Efile 2350, Efile 4868, Efile 7004, Efile 8868, Efile Extension, Efile for an Extension, express extension, Extend your Deadline, Extension of Time, Federal Income Tax Extension, File Later, File Taxes later, Form 2350, Form 4868, Form 7004, Form 8868, Income tax Extension, IRS Extension, Online Extension, Pay Later, Personal Income tax, Six months Extension, Tax Return Preparers on April 11, 2018 by TaxExpert.